Politics plays a huge role in health care in the United States, especially with the current reform debate and proposals seen earlier this year when conservatives wanted less government involvement and liberals wanted more government action. But there are a number of other factors, such as the economy, technology, globalization and culture, that influence health care in this country. And Dr. Sunday Ubokudom, UT associate professor of political science and public administration, investigated all the factors for a comprehensive review of what affects the U.S. health-care system. 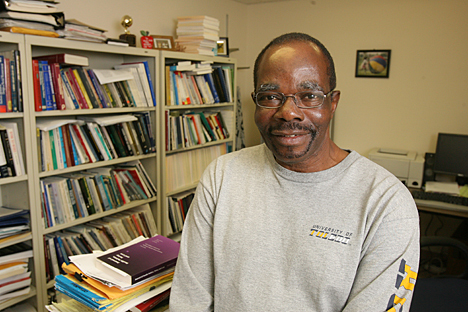 His review, “The Ecology of Health Policymaking and Reform in the United States of America,” was published recently in World Medical & Health Policy. Ubokudom, with the help of UT Medical Center research associate Jagdish Khubchandani, looked at the political effects but also identified a host of other issues such as the economy, with the $2.24 trillion spent for health care in 2007 accounting for 16.2 percent of the nation’s gross domestic product. Demographics also play a large role with doctors choosing where to set up practices, which is more often in a city or suburb than in a rural area or the inner city. Similarly, hospital locations are driven more by financial considerations than the needs of the population, leading to duplications or shortages of care. The authors also explored how legal ecology has an impact with insurance regulations and malpractice issues. Ubokudom began his research before the recent health-care reform bill was passed and accurately predicted that economic and social factors needed to play large roles in the debate if reform were to happen. Still, what was passed is not enough to make substantial change because there wasn’t enough discussion of the other factors and the greater good, Ubokudom said. Before they officially start high school, 35 northwest Ohio students will learn what medical school is like. The students participating in the 13th annual CampMed program at The University of Toledo this week will receive close-up, hands-on lessons making casts, learning procedures in a medical simulation center, suturing a wound, and what sports medicine is all about. The two-day CampMed program will be held Thursday, June 17, and Friday, June 18, on UT’s Health Science Campus. It is coordinated through the UT Area Health Education Center program, which along with other chapters throughout the country, strives to improve the health of individuals and communities by transforming health care through education. UT medical students serve as camp counselors, and the students also will interact with physicians and professors. The students will begin their med school crash course Thursday morning with a “tools of the trade” session where they will learn to use blood pressure cuffs and stethoscopes. Lessons will continue for two days with multiple morning and afternoon sessions that include a perioperative experience where they dress in surgical gear, including gowns, gloves and masks; look at a medical helicopter; and practice their diagnosis ability with real “patients” in a clinical skills lab. CampMed aims to stimulate interest in the medical field for the students who will start high school as freshmen this fall. The competitive program, which began in 1998, requires students to submit a letter of recommendation, a nomination from a science or math teacher or counselor, and a personal essay to be chosen to participate. CampMed is a scholarship program at no cost to the students, most of whom are minority, rural and from other underrepresented groups in northwest Ohio. 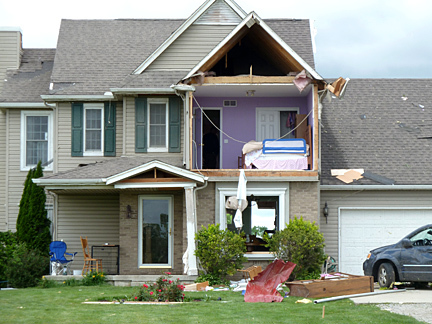 The Delta home of Kelli and Quinn Chovanec was ripped apart by a tornado that touched down in Fulton County June 5. At 10:42 p.m., Kelli Chovanec sent that text to her husband, Quinn, from the chaos of her rural Delta home on Saturday, June 5. Minutes later, the registered nurse in 6AB at UT Medical Center felt she was literally fighting the force of nature for the lives of herself and her two children. The evening had begun on a high note. Chovanec, whose husband was away on business, had taken her daughters, Breann, 4, and Kathryn, 2, to an outdoor theater in nearby Liberty Center. This shows the front of the Chovanec home. Dashing inside the family’s two-story home on Fulton County Road 7 amid a rage of rain and wind, Chovanec armed her children with flashlights and directed them to the basement. She remembered her ears popping as they descended to a basement closet. Before she could close the door, however, a gust of wind blew it shut. “I remember thinking, ‘We’re in trouble.’” Chovanec said. They emerged to a neighborhood in chaos, with homes leveled and people crying for help as they realized the full impact of an EF2 tornado. 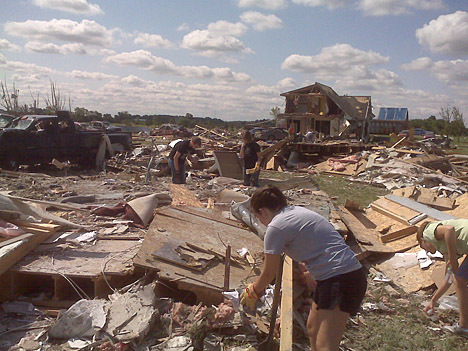 The storm spawned numerous twisters throughout northwest Ohio and southeast Michigan, killing five people. The Chovanec family has been tasked with many challenges in the week since the tornadoes: finding temporary residence, preserving valuables from their home, fending off looters, and coping with the shock of nearly losing everything. She’s grateful for support from family, friends and those in the UT community. “They’ve really rallied around me,” she said, noting that colleagues have helped her retrieve items from her home, assisted with cleanup, provided clothing and toys, and donated money and gift cards. With additional assistance in the works from federal and local organizations, she realizes her life can be rebuilt, eventually. For now, she is focused on returning to some type of normalcy by rejoining colleagues in 6AB this week. There was a ray of good news last week: Chovanec saw an ultrasound image of her unborn child, who is due later this year. Fulton County neighbor and UT colleague Gail Brown, systems analyst 1 in Clinical Informatics, said she and her roommate had some property damage but were spared from the destruction. “Although we sustained a fair amount of damage to a pole barn and lost a lot of trees, we were incredibly fortunate to not have been injured or have our home damaged,” Brown said. “All around us there is massive destruction to many homes and buildings. Some people lost everything. Brown asked for continued prayers for those who suffered loss. Employees wishing to write checks to support co-workers who were impacted by the tornado may make them out to The University of Toledo Relief Fund and send them to the Pastoral Care Department, Mail Stop 1055. The University of Toledo and the city of Toledo were highlighted in USA Today for swapping the area’s Rust Belt image for one of solar energy research and development. 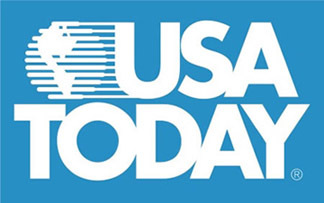 The article was published today on the cover of the national publication’s Money section as part of the USA Today’s ongoing Seeking Solutions series. The University’s world-renowned research in the areas of photovoltaics and thin-film solar panels was described in-depth, along with UT’s relationship with community leaders and businesses to drive the economic development of the region. USA Today reporter Judy Keen also noted the University’s effort to educate students in this growing alternative energy field with the Scott Park Campus of Energy and Innovation and the new School of Solar and Advanced Renewable Energy. Regional efforts to capitalize on the growing alternative energy sector also were highlighted; these include the Toledo-Lucas County Port Authority’s work to make it easier for solar manufacturers to ship their products, the Regional Growth Partnership’s venture fund to help startup companies, and Owens Community College’s programs to retrain workers for solar jobs. A new master’s degree at The University of Toledo will bring together both the science and business knowledge necessary for those interested in alternative energy careers. The new master’s degree in photovoltaics will have a strong foundation of core course work in physics and photovoltaics, as well as business courses related to manufacturing management. The goal is to cross-train the students in academic expertise and workplace skills, said Dr. Patricia Komuniecki, vice provost for graduate affairs and dean of the College of Graduate Studies. In the two-year program, which will welcome its first cohort this fall, students will conduct a research project with UT faculty and participate in practical training in a local photovoltaic manufacturing company, rather than completing a traditional master’s degree thesis. UT has already set up relationships with Xunlight and Xunlight 26 Solar for those experiences, and will be seeking new partnerships as well. The new master’s degree, which is a collaboration of the colleges of Graduate Studies, Arts and Sciences, and Business Administration, is modeled after the growing trend of Professional Science Master’s (PSM) programs. The plan is to include the program in the new School of Solar and Advanced Renewable Energy. The University is undergoing the process to have the new photovoltaics master’s program recognized as a PSM by the National Professional Science Master’s Association. Komuniecki learned about the degree, being called by some “the 21st-century MBA,” at a conference last year and came back to UT energized about pursuing the innovative and practical course of study here. And Dr. Sanjay Khare, UT associate professor of physics and director of the new program, helped her get it started. Both said the presence of a world-class photovoltaics research faculty in the Department of Physics and Astronomy, led by Professors Robert Collins, Al Compaan, Xunming Deng, Randy Ellingson, Michael Heben and Sylvain Marsillac, made this unique program a possibility. The new master’s degree in photovoltaics builds on the existing master’s degree program in physics with the addition of the business courses in place of electives and the industrial experience. It is targeted toward students with a bachelor’s degree in physics, materials science or a related engineering discipline that has the components of technical training. Students pursuing this degree could be mid-career professionals or full-time students who have a passion for the science, Komuniecki said. The photovoltaic industry grew 60 percent in 2008 alone, Khare said, and projections show it will continue that rapid growth as the costs of producing electricity from solar energy become equal to and less than those from fossil fuels in five to 10 years. And as it does, there will be a need for people who know the science and the math working in the solar industry, he said. The master’s degree in photovoltaics was modeled after other Professional Science Master’s Degree Programs and the goal is that once approved, this would be the first of several PSM programs at UT. As of last month, there were 194 approved PSM programs with about 2,600 students in the country, with many in the areas of biotechnology, bioinformatics and environmental science. UT’s program would be unique with the photovoltaics emphasis. Southern Illinois University in Carbondale has a PSM in advanced energy and fuel management. UT also would be the first public university in Ohio with a PSM program. Case Western Reserve University has several — biotechnology, chemistry, math, physics, statistics, and science and technology. And the University of Dayton has a financial mathematics program. The University is recruiting students for the first cohort, and students interested in the new photovoltaics program should contact Khare at sanjay.khare@utoledo.edu for more information. With its annual assessment of the president finished, The University of Toledo Board of Trustees emphasized complete support for the president in an announcement to the UT community June 14. Board Chair Olivia Summons said the trustees are “100 percent behind” UT President Lloyd Jacobs, his handling of the University’s sustainability during the last four years, and the ongoing development of local, regional, national and international partnerships. Fall, who previously has served as chair of the Board’s Finance Committee, praised Jacobs for the University’s financial management and oversight, saying the trustees have “great confidence” in UT’s fiduciary strength, even in this time of difficult and challenging budget constraints. Summons said it is important for Jacobs to continue assembling a strong senior leadership team, pointing to upcoming searches for a provost and deans in the colleges of Arts and Sciences and Law, the Judith Herb College of Education and the School of Solar and Advanced Renewable Energy. Both Summons and Fall pointed to the need for improved communication with stakeholders inside and outside the University and asked Jacobs to examine current communication methods and consider enhancements. Summons also said it is important for Jacobs to recognize that some feel he has a perceived allegiance to the Health Science Campus. “While I believe the president has done an excellent job balancing issues across all campuses, it’s important to acknowledge that this impression exists and seek to alleviate these concerns,” she said. Summons also thanked Faculty Senate for submitting to the Board for consideration an evaluation of the president. Jacobs’ evaluation, conducted by faculty members who returned surveys, included comments on his performance, many of which were critical. “Looking back to where we were four years ago, the Board is pleased by where UT is today,” Summons said. “Whether the measure is student enrollment, community partnerships, external research funding, patient-care quality or an increasingly international reputation, this institution is on the right track and the leadership of President Jacobs is a primary reason why,” she said. For Colette Egner and her family, donating their bodies to The University of Toledo College of Medicine was a practical decision that will help advance science and medicine. She, as well as her parents, husband and sister, signed up to participate in the Anatomical Donation Program in the early years of the program at the former Medical College of Ohio that began accepting bodies in 1969. Her husband, Richard A. Egner, passed away in 1987 and her father, John D. Kalisz, died last year. The family was able to have memorial services for their loved ones, Egner said, but did not need to deal with funeral arrangements and the associated expenses. The Kalisz family was featured recently by WTOL’s Chrys Peterson in a special news report on UT’s Anatomical Donation Program. Peterson also spoke to students and faculty involved in the program. Registration for donation requires completion of several forms, which must be submitted to the UT Department of Neurosciences at least one week prior to the donor’s death. A donation fee of $100 must accompany the completed registration. The family is responsible for arranging and paying for transportation of the deceased donor to the Department of Neurosciences. All other expenses, such as permits, death certificate and cremation, are arranged and paid for by the University. After the medical studies are complete, students who learned from the donated bodies organize a memorial service to honor the donors and their families. The University also arranges for cremation of the remains, which are then either returned to a relative or interred in UT’s communal memorial plot at the Historic Woodlawn Cemetery in Toledo. About 3,000 students at the University learn from cadavers each year, including medical and physician assistant students, as well as those studying other health-care fields such as physical therapy, occupational therapy and kinesiology. Valerie Allen, a first-year medical student at UT who just finished the Human Structure and Development course that uses a cadaver, said the opportunity to use a real body to learn was very important. Allen said she and other students have great respect for people who make the decision to donate their bodies so future health-care providers can learn from them. Allen’s grandmother, in fact, is considering donation after hearing from her granddaughter how much the cadaver helped with her education. 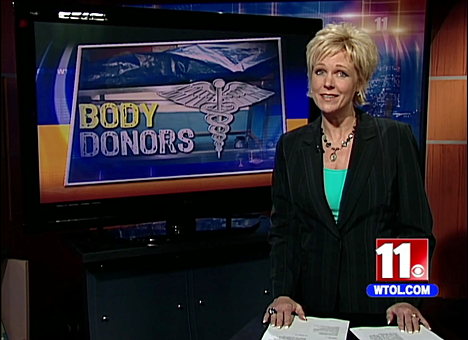 For more information, contact the Anatomical Donation Program at 419.383.4109 or bodydonation@utoledo.edu. Nursing student Courtney Clement took this photo of UT student Katie Towns, left, and Lourdes College student Chelsea Aiello cleaning up in Genoa. 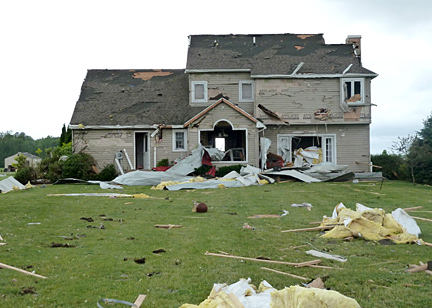 On the morning after thunderstorms and tornadoes swept through northwest Ohio and southeast Michigan, Courtney Clement and a friend drove out to see the aftermath. A University of Toledo nursing student and three-time veteran of alternative spring break trips, Clement had seen the destruction Hurricane Katrina had brought to the Gulf Coast. As she pulled up to Lake High School, she found the scene unsettlingly familiar. Turning to social media and text messages, Clement rounded up a group of eight students to help clean up the home of a neighbor of one of her friends in Genoa. Clement said the path of the tornado is easy to follow, though why some homes were leveled and others left largely unscathed is not. The deck of the leveled home they worked on was virtually untouched, she said. A group is planning to go back tomorrow, said Clement, who is planning her help around her continuing nursing clinical education. Other students are planning trips throughout the week. On Sunday, Clement and others are planning to have 100 people travel to Genoa to help clean up. 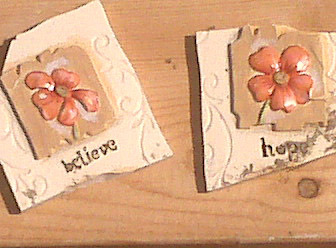 Nursing student Courtney Clement also took this photo of tiles recovered during cleanup efforts. Clement said beyond just cleaning up homes for rebuilding, acres of fields remain where tornados have strewn parts of homes and personal items. Clement said those interested in helping can visit a new Project Help the Tornado Victims Facebook page at www.facebook.com/group.php?gid=127136270640435&ref=search. More information about volunteering or donating to assist the victims of the June 6 storm is available here. The Glacity Theatre Collective will present Beckett’s existential tragicomedy three weekends in June in Studio A at the Valentine Theatre, 410 Adams St. 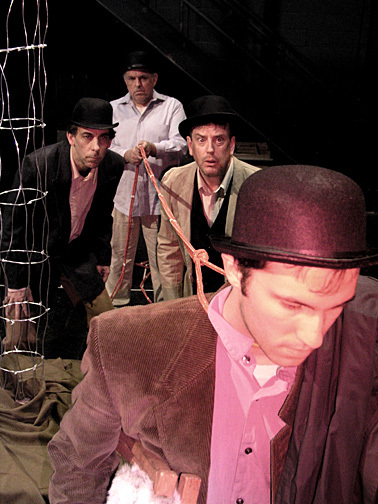 The subject of intense debate and conjecture over the years, “Waiting for Godot” has never lacked for interpretations, according to Glacity Theatre Collective Executive Director Holly Monsos, UT associate professor and chair of theatre and film. “It has been performed in South Africa with mixed race actors during apartheid, in prisons, in churches, on Broadway with Steve Martin and Robin Williams, and in small black box theatres, like our own Studio A,” she said. “It has been seen as an allegory for the Cold War, a reflection of [Carl] Jung’s four archetypal personalities, a Christian parable, and a metaphor for the relationship between Ireland and England, to cite just a few approaches. “Glacity’s intimate performance space makes this the perfect opportunity to see one of the most acclaimed and controversial plays in Western literature,” Monsos said. Glacity Theatre Collective actors Kevin Hayes and Dr. Ben Pryor, UT assistant vice provost for learning ventures and associate professor and chair of philosophy, play Vladimir and Estragon, and Dave DeChristopher, UT instructor of theatre and film, plays Pozzo, and Kevin Barron plays Lucky. The Boy will be played by Zachary Safadi. The production team includes Glacity Theatre Collective Artistic Director Cornel Gabara as director, set design by James S. Hill, and lighting by Donald Robert Fox, all three of whom are faculty members in the UT Department of Theatre and Film. 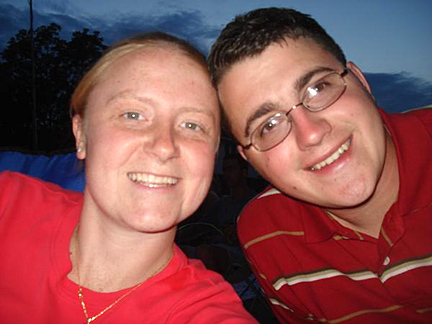 Dan Norton, a senior majoring in theatre at the University, is the production stage manager. “Waiting for Godot” will open at 8 p.m. Friday, June 11, in Studio A at the Valentine Theatre. It continues with 8 p.m. performances Saturday and Sunday, June 12 and 13, and Friday through Sunday, June 18-20, and Friday and Saturday, June 25 and 26. Doors will open one half hour prior to curtain. Studio A features club-style seating and a cash bar for patrons. The Sunday performances June 13 and 20 will be “pay what you can” shows, and tickets will be available at the door only. It’s UT pride in a whole new medium: bras. A team from the UT Office of Marketing created the “Know More” bra, which won first place in the American Cancer Society’s Battle of the Brassiere. A total of 31 bras were submitted this year. The battle was held as part of the Making Strides Against Breast Cancer walk May 8 at the Town Center at Levis Commons. Team members included Esther Fabian, associate vice president for branding and creative services; Michelle Hoch-Henningsen, creative director; Sue Benedict, graphic designer; Joni Bishop, graphic designer; Debbra Cooper, traffic manager; Stephanie Delo, graphic designer; and Amanda Russell, graphic designer. The group’s design was inspired by UT’s advertising campaign theme, “More,” and the midnight gold and blue colors. The bra’s design was conceived by the team months ago over lunch, with construction taking about 10 hours. The design incorporates UT lanyards, keychain bobs, two pins, and pom-pom. Most of the items were purchased in the UT Bookstore. Since the win, the UT Medical Center’s Radiation/Oncology Department has asked if it can display the award-winning work.